« Trading floors the world over are littered with the bodies of those who tried to trade energy futures » the saying goes. I’ve heard it used recently regarding those who tried to short JGBs but most traders in the oil & gas business would agree. Remember Brian Hunter of Amaranth fame who blew up the whole multi strategy fund on over leveraged natural gas contracts in Alberta? In a few days, over £5Bln of capital evaporated in the clear blue Canadian sky to protect his positions, to no avail. The best and brightest have tried to ‘fly by the sun’ only to be humbled by the sheer complexity of assessing the value of energy prices. I once had a colleague who ran a European equity fund who refused categorically to touch equities in the sector as forecasts on the price of oil were more akin to sorcery than sound financial management. ‘What fates impose, that men must needs abide; It boots not to resist both wind and tide’ the Bard once said in Henry IV when the Earl of Warwick was tempting fate. 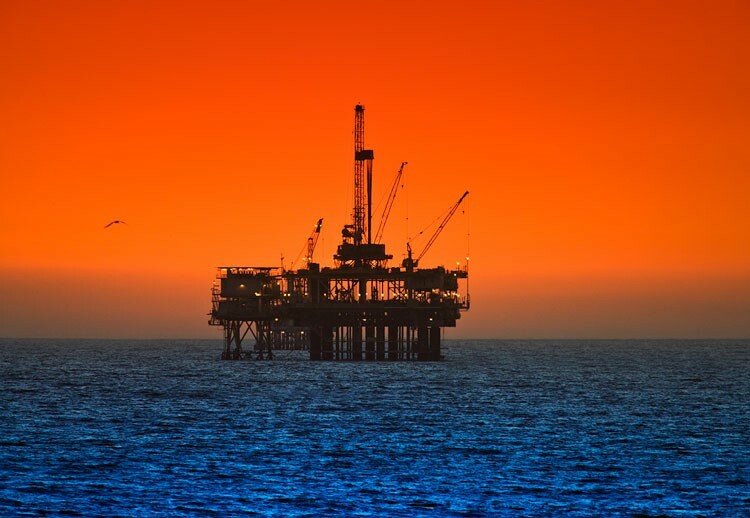 One person whose been bucking the trend of late is Pierre Andurand of Andurand Capital who launched his commodities hedge fund in 2013 and traded successfully around a few very strong calls, both on the upside and downside, for oil. 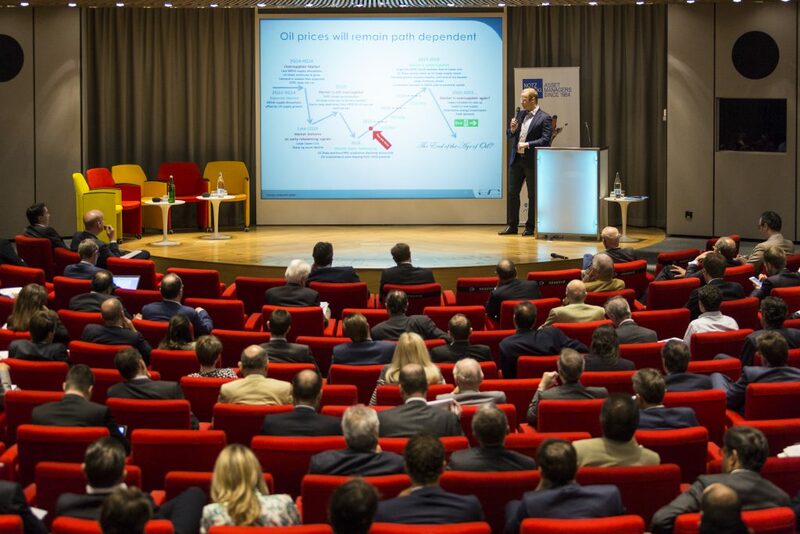 We invited him as a guest speaker at the Notz Stucki Investment Conference on 28 June to share his views and shed some light on what drives his thought process. Pierre Andurand during his presentation. ‘There’s clearly been some volatility in price’ states Andurand and goes on to add’ at these levels though I’m positioned to benefit from a multi-year rally in the price of oil.’ Andurand couldn’t have called it better these past 2 years and this message was heard loud and clear. He was very aggressive in communicating on the imminent collapse of the price of oil in 2014 and timed it perfectly last year, turning bullish on crude at the lows of pretty much $28. ‘The price of crude rose during the noughties to £115/barrel on the back of above trend EM and global growth. Subsequent to that, the market stayed balanced (at least from 2011 to 2014) as MENA supply disruptions (i.e. through the Arab spring) were offset by US supply growth’. Volatility was also down as large non-OPEC supply was offset by large option buying. ‘This didn’t last though’ opines Andurand ‘in 2014 because of a 1.5% deficit in storage capacity, the market plummeted from $111 to $28. OPEC’s decision not to cut during this period exacerbated the problem. Cutting production by OPEC members only made higher cost non-OPEC members more profitable and once the market understood it was in OPEC’s interest to keep prices low to gain market share, it was clear prices would keep on falling. 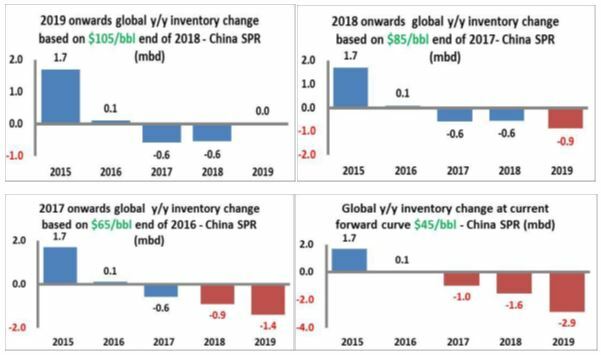 In early 2015, markets came back slightly on the reappearance of storage capacity, lowered US rig counts and sharp cap ex cuts.’ It’s no surprise that inventory levels and storage capacity are the main drivers of price. 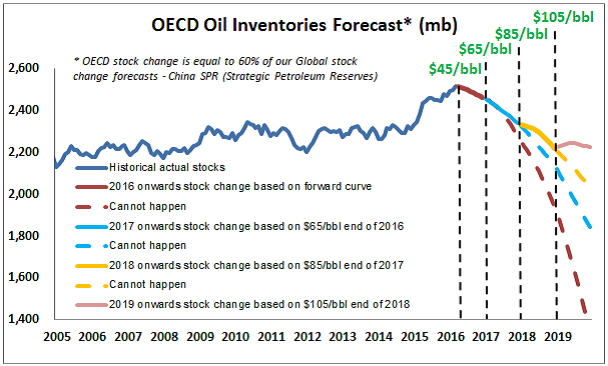 ‘The market is still oversupplied in 2016 with OPEC still ramping up production and due to long lead times, non-OPEC (ex US) has not declined yet putting near term pressure on price.’ concludes Andurand. As far as demand is concerned, Andurand was fairly sanguine about the outlook for global growth and barring any tail events, it should stay fairly supportive. He also sees the impact of renewables, eating away at demand for oil, not being meaningful before 2023/2025 when electric cars make up 10% of the auto market. They shouldn’t be a headwind for price until then.